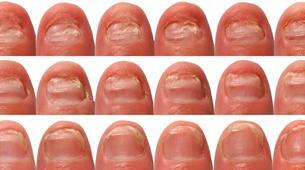 Fungal nails are nails that are infected with a fungus or yeast. Onychomycosis is the medical term for a fungal nail (‘fungal: mycosis – nail: onycho’) and can occur on toenails and fingernails. Fungi are microscopic organisms that do not need sunlight to survive. Some fungi have beneficial properties, while others may cause infection and illness. A fungal nail does not look pretty. It usually starts with a discolouration in the corner of the nail and slowly spreads to the nail cuticle. The visible changes to the nail are easily recognised. A fungal nail is contagious and often develops from athlete’s foot, which is a fungal skin infection. If athlete’s foot is not treated in time, the fungus may spread to the nails. Most minor nail problems heal without treatment, but more severe nail disorders such as fungal nail should be treated correctly. A fungal nail will not get better without help; you have to treat it! Would you like to know if you have a fungal nail? 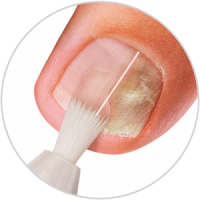 Do the Mycosan fungal nail test and find out directly. If you are not sure if you have a fungal nail, it is adviced to that you always visit a doctor or pedicurist and ask them for advice. Do the fungal nail test! 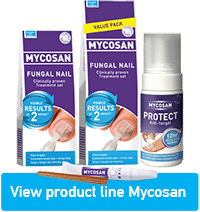 Benefit packaging of Mycosan Fungal Nail for the treatment of multiple fungal nails.